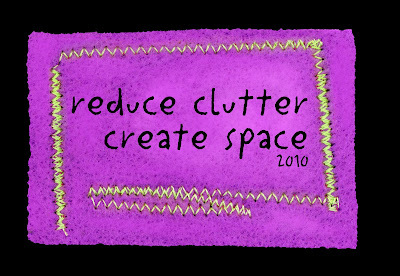 Here is my second Reduce Clutter; Create Space spotlight interview with Nancy from Summer Sky. 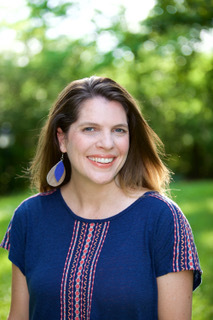 You will enjoy her honest and inspiring look at how to manage the clutter in your life. Take a deep breath…and dive right in. After the birth of our second child in 2005, I started to really let things go. I no longer found the time to put things away properly. I certainly had no time to sew. Then, two years ago, I broke my ankle. Many people recover from such injuries within a few months, but I ended up having three surgeries and much healing before I could walk well. Clutter to me is the stuff of life that should be stored, given away, or trashed. It’s the things that bog you down and prevent you from living a fuller life. I find clutter highly distracting. It fractures my mind: I’ll go into the laundry room (which doubles as our pantry) to put clothes in the wash and fold some clean laundry. But I see the groceries from my morning store run are still sitting out. That’s because the shelves are too full, even though the pantry’s quite adequate. Soon I’m rearranging jars of food, but then the phone rings or my son needs help, and before you know it, I haven’t finished any task and the room might even be worse off than before. It’s useful to consider what your clutter represents. For me, it’s a visual reminder: the broken toy that needs to be glued, the laundry that needs washing, the form to fill out, the project in progress. I have a secret fear that if I put these things away, I’ll forget them entirely, until they become an emergency. I’m focusing on three areas to start—each with “high impact” on our daily lives. First, the entryway, where we store our coats and shoes, and where mail gets dumped. I need a couple more hooks for the kids, I need to empty and sort the drawers of a bureau that’s right by the door. The second is our “office / library,” a small room that our whole family uses. We keep our computer and most of our books there, but there’s also a small table where the kids can sit and create things. The main problem here is piles of unsorted paperwork and cluttered shelves. The third is the pantry / laundry room, which has some stand-alone shelves that are taking up too much space. But first, I have to find a home for all the things on those shelves. This is just the beginning—the upstairs is full of boxes of unsorted children’s clothes, books, and toys that need to be given away or sold. Yes. It’s amazing how easy it is to let go of things once you get started. You have to get past the phase of simply moving everything to a new location within your home. That’s the biggest mistake: just shuffling clutter from place to place, even if it’s in an organized fashion. You don’t need it right now, but you might need it “someday.” Chances are you don’t need half the stuff you’re shifting around. Yesterday, for the first time, I wrote down the long list of sewing projects I’ve been contemplating. They’ve been rattling around my brain, but because I didn’t want to get started on another “mess,” I didn’t get them down on paper because what was the point? Now I’ve made the list plus written down the “next step” (choose fabric, find a pattern, etc.) toward achieving the higher-priority projects. 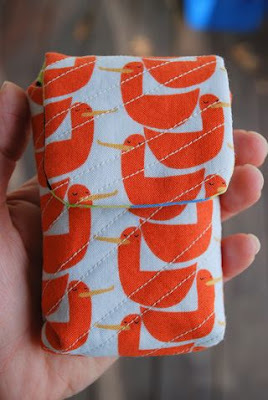 And I finished a little project that’s been on the back burner since last fall: a case for my friend’s cell phone. Finding some time every day to do a little decluttering, even if it’s just for 5 minutes. 6) How about the hardest? Realizing how far we have to go. It’s just the beginning. 7) Any surprises so far? Finding lots of cabinet space for my fabric stash that was lying about by getting rid of items I never use and consolidating the rest. Also, finding two copies of a book I’ve want to read, Cold Comfort Farm by Stella Gibbons. I wonder if, without decluttering, I would’ve acquired a third copy a few months down the road. 8) What are your intentions for joining other “explorers” on this journey? To see what comes of the decluttering—the special moments with our families, the feeling of coziness in our own homes, the creativity that’s allowed to flourish in big and little ways. 9) Any tips, thoughts or suggestions you might want to share with others who are interested in starting to “reduce clutter” so they can “create more “space” in their lives? Yes, there are some wonderful books out there to guide us. I recommend checking them out of the library, for obvious reasons! If you’re a parent, I suggest Simplicity Parenting by Kim John Payne. He can really light a fire under you to ‘declutter’ every part of your family’s life. He has a wonderful checklist for sorting your children’s things. There’s a lot more to this book—it’s about creating space in order to see your child more clearly for the person that they are. Another book I suggest reading (vs. owning) is Organizing for the Creative Person by Dorothy Lehmkuhl and Dolores Cotter Lamping. The book encourages “visual” organizers by explaining why the tend to have clutter. Now my goal is to create an inspiration board to remind myself of WIPs, rather than relying on piles of WIPs themselves. Last is a book I own because it’s so orderly: Jennifer Ford Berry’s Organize Now! It’s spiral bound (stays open) and it’s highly specific (which I need). For example, pages 110-111 are devoted to “Organiz[ing] the Kitchen Countertops.” Her suggestions are insightful because she avoids the obvious. She has practical suggestions for every part of your life (recipes; pets; medicine cabinet; vehicle; purse; photographs). 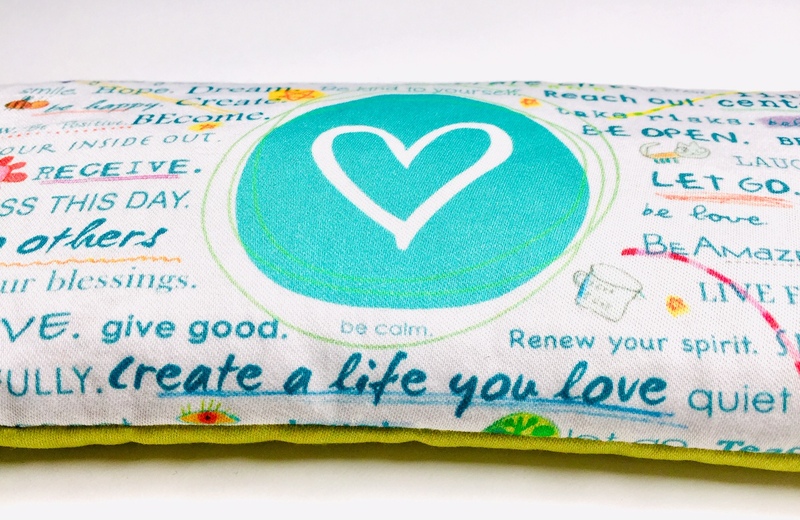 Then she has ideas for staying organized (once a month, every 3 to 6 months, once a year). 10) Anything else to add? I feel like I can see the light at the end of the tunnel. And I’m very curious to see what ideas and thoughts others on this journey have to share. 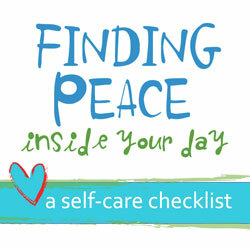 Your Personal Reflection: What clutter in your life have you been avoiding? Are you ready to let go so that you have more space for what truly matters most? Leave a comment here and grab a Reduce Clutter; Create Space badge if you want to join this year-long quest. I would be lying if I didn't share that I get excited when I see your latest blog waiting for me in my inbox. It's like a little treat with my morning coffee and I love it! So thank you for sharing your journey with me and so many others. I am lucky. Since I will be traveling the rest of the year, I don't have a home to de-clutter. But I do have my car! I am in the process of researching what the best way to organize my trunk would be for my year long cross country trip. I have lots of things to take into account and I want everything to be easily accessible AND I will have my pup with me.. Phew! I am planning on writing a post about Feng Shui-ing my car. I'll keep ya in the loop. My point, was that I too am clearing out what I do not need' clothes I don't wear, books I won't read, journals I can save until my return. De-clutter. Reduce. Condense. Be Free. It was interesting to read Nancy's interview! I am continuing to declutter and feeling better for it – I am working up to doing my clothes …..
Hi, I just found you from Anne's Frayed at the Edge blog, and you are just what I needed today! I'm grabbing a badge and starting today. I've been thinking of dragging out the sewing machine for months,… but hate the thought of just creating another clutter corner. Soooo inspiring!! I don't feel alone anymore in my boat! LOL! I'll re-read it again to give me the strenght to continue my declutter work! Not easy but so rewarding! Thans Shannon for this wonderful interview! Thank you! Just ordered those books from the library. Hooray. Wow, thanks, Nancy and Shannon! Fantastic candid responses, including photos of what real life looks like. You guys are inspiring! Thanks for this honest interview! I started decluttering with great enthusiasm, Shannon, and have managed to do quite a bit, but for the last few weeks the positive energy has diminished somewhat. I am avoiding looking at my studio cupboards as I so hate getting rid of the crafty bits I hoard … Also, I went through a collection of about 30-plus scarves last week (light summery ones, not wool) and I didn't want to get rid of any! But here is the thing, I almost never wear any of them! So what is that about? It is odd because I easily give away clothes to charity … I am wondering if I can make something that will use up most of them – something that I will actually use?